Perry Keyes calls them “ghost stories”. The title of his new album, Sunnyholt, refers to the road leading out west in Sydney, which delivered more than 150,000 people in the late-’60s, early-’70s. As the inner-city slums were cleared for high-rise and medium-density housing, the people were “re-settled”, promised jobs and a new start. Sunnyholt tells the story of the families that fell between the cracks. Deep in the heart of nowhere. 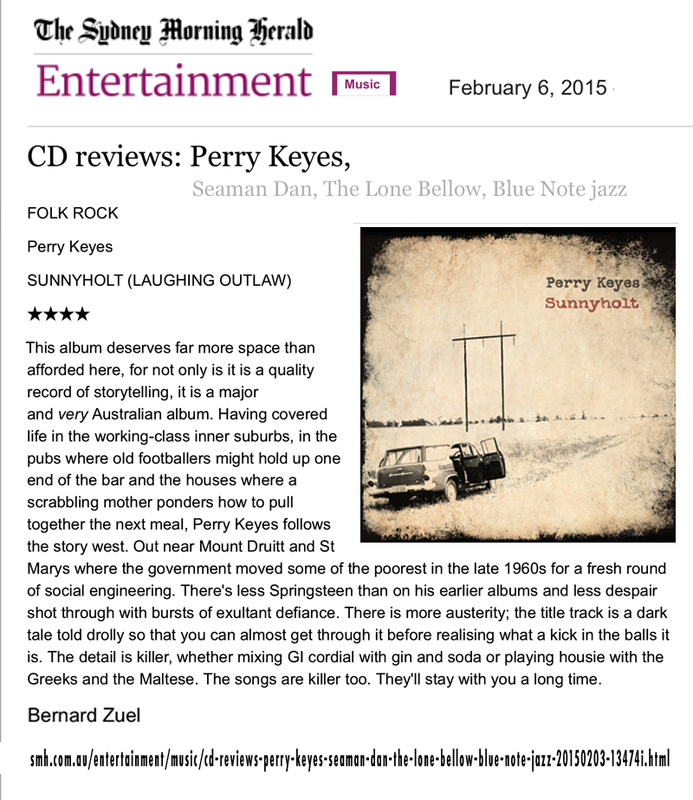 Perry Keyes has carved an impressive niche in the rock landscape with songs that mourn and celebrate in equal measure the history and culture of the neighbourhood in which he grew up, Sydney’s Redfern, Waterloo and surrounding suburbs. This latest album, his fourth and the first part of a two-album series, takes that principle a step further with 10 songs that document, poetically and with a mixture of passion, humour and nostalgia, how those same suburbs evolved in the 1960’s and 70’s, when much of the population moved west to accommodate inner-city development. Musically Keye’s previous albums such as “Meter ” and “The Last Ghost Train Home” switch between atmospheric folk to all-out rock ’n’ roll, a style that has seen the name Springsteen mentioned in his wake. Certainly his vivid descriptions of working-class life are from the same well, but Keyes sings from his own heart and is joined here most impressively by singer Bek-Jean Stewart on the despairing Shitville. There’s more than a touch of Lou Reed in the strings-laden title track, a somber ballad documenting the contrasting cultures on the streets he knows: “The inner city’s fine if you can spend your time on 10 types of coffee and low-fat food”. The opening of The Soft Blue Sky, a sea shanty tune topped by horns, also looks back at better times, while Brylcreem Alcohol and Pills is biting and nostalgic. Sunnyholt is singular in its vision. Maybe part two will broaden the palette. Perry Keyes is not your typical rock star. There’s no swagger. Indeed, he walks with a limp – the result of being the last laboratory-confirmed case of polio in Australia. 3 songs of his new release Sunnyholt plus live performance of “Home is Where the Heart Disease is”. 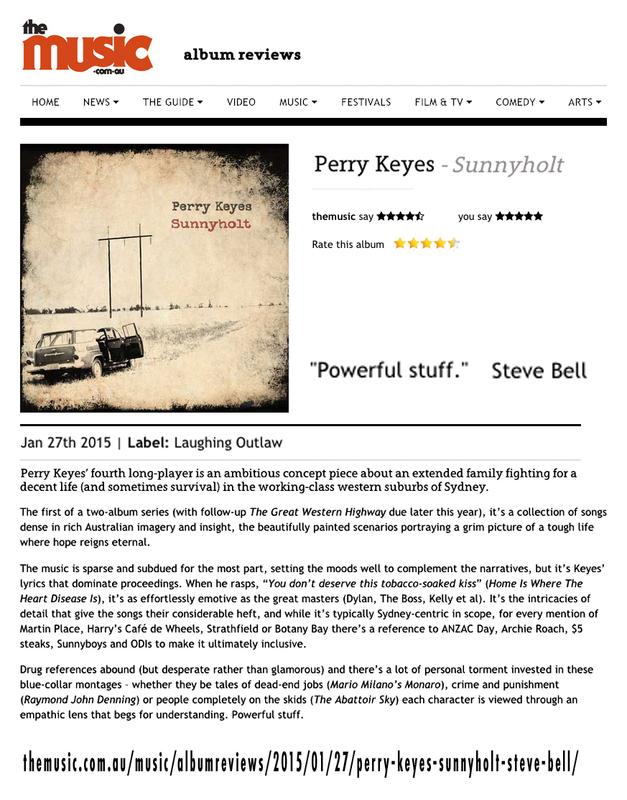 Perry Keyes – Sunnyholt – 2SER Feature album of the week. This album deserves far more space than afforded here, for not only is it is a quality record of storytelling, it is a major and very Australian album. Having covered life in the working-class inner suburbs, in the pubs where old footballers might hold up one end of the bar and the houses where a scrabbling mother ponders how to pull together the next meal, Perry Keyes follows the story west. Out near Mount Druitt and St Marys where the government moved some of the poorest in the late 1960s for a fresh round of social engineering. There’s less Springsteen than on his earlier albums and less despair shot through with bursts of exultant defiance. There is more austerity; the title track is a dark tale told drolly so that you can almost get through it before realising what a kick in the balls it is. The detail is killer, whether mixing GI cordial with gin and soda or playing housie with the Greeks and the Maltese. The songs are killer too. They’ll stay with you a long time. I’m alive tonight!” So starts the fourth album by Perry Keyes, the best songwriter you’ve never heard. It’s an optimistic opening, but don’t expect a fun ride.Sunnyholt refers to the road running through Sydney’s outer-western suburbs, where many inner-city residents relocated in the ’60s and ’70s. These are heartbreaking tales of wasted lives, where “a lonely girl knows how it feels to have the beautiful things ignore her”, and “I’d trade all the lights on Sydney Harbour to feel my father’s arms again”. Bek-Jean Stewart’s sublime vocals sweeten Raymond John Denning and Shitville, but there are no happy endings in Keyes’ songs, unless they’re “in $59 rooms selling stoned rub and tugs”. You’ll hear snatches of Lou Reed, Tom Waits and Bruce Springsteen, but Perry Keyes is telling his own story. And there is no better Australian songwriter. Perry Keyes’ fourth long-player is an ambitious concept piece about an extended family fighting for a decent life (and sometimes survival) in the working-class western suburbs of Sydney. The first of a two-album series (with follow-up The Great Western Highway due later this year), it’s a collection of songs dense in rich Australian imagery and insight, the beautifully painted scenarios portraying a grim picture of a tough life where hope reigns eternal. The music is sparse and subdued for the most part, setting the moods well to complement the narratives, but it’s Keyes’ lyrics that dominate proceedings. When he rasps, “You don’t deserve this tobacco-soaked kiss” (Home Is Where The Heart Disease Is), it’s as effortlessly emotive as the great masters (Dylan, The Boss, Kelly et al). It’s the intricacies of detail that give the songs their considerable heft, and while it’s typically Sydney-centric in scope, for every mention of Martin Place, Harry’s Café de Wheels, Strathfield or Botany Bay there’s a reference to ANZAC Day, Archie Roach, $5 steaks, Sunnyboys and ODIs to make it ultimately inclusive. Drug references abound (but desperate rather than glamorous) and there’s a lot of personal torment invested in these blue-collar montages – whether they be tales of dead-end jobs (Mario Milano’s Monaro), crime and punishment (Raymond John Denning) or people completely on the skids (The Abattoir Sky) each character is viewed through an empathic lens that begs for understanding. Powerful stuff. 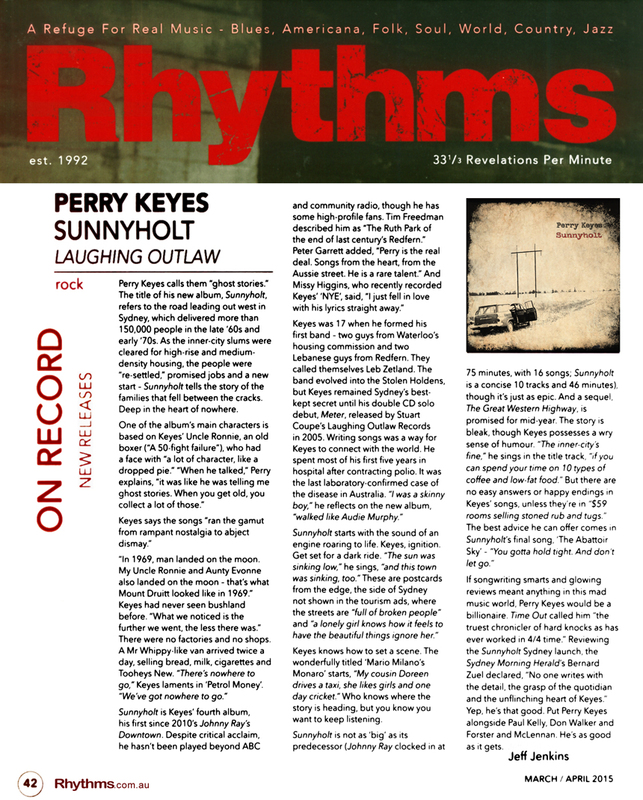 There is a slight but crucial error in the press release accompanying the soon to be released fourth album from Perry Keyes, Sunnyholt. 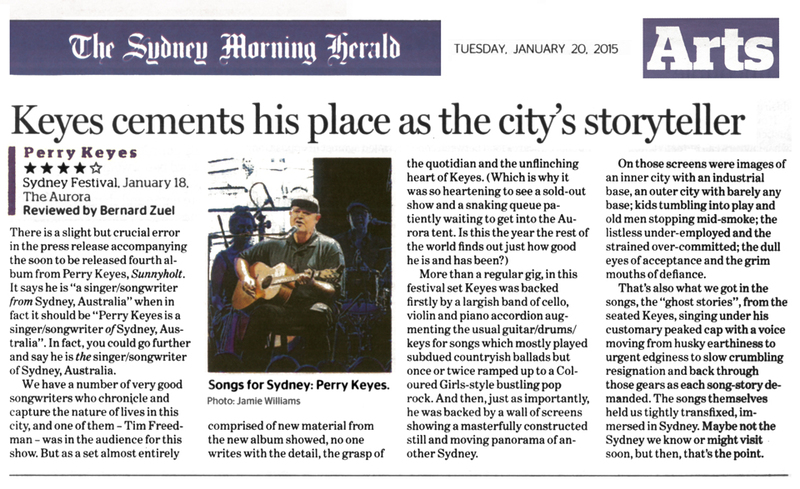 It says he is “a singer/songwriter from Sydney, Australia” when in fact it should be “Perry Keyes is a singer/songwriter of Sydney, Australia”. In fact, you could go further and say he is the singer/songwriter of Sydney, Australia. Perry Keyes crafts portraits of city life. Capturing the essence of Sydney’s once working-class suburbs – through the experiences of family and neighbours – the acclaimed musician presents the premiere of his Sunnyholt project. Sharing tales of Sydney’s western suburbs from the late 60s to the present day – from the perspective of his extended family, who were moved there by the Housing Commission – Keyes utilises a full band, visuals and personal stories to trace the journey of generations disintegrating under the social and economic pressures of life on the city’s fringe.